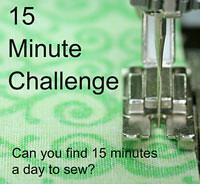 I'm linking up to Kate's 15 minute challenge again this week . Pop on over to her blog for a peek. Apparently her daughter has a plan to make money on eBay from Kate's fabric stash once Kate kicks the bucket. I've already given Little Miss Sunshine strict instructions that she is to come and rescue my stash when I pop off this mortal coil or I'm sure my lovely fabric will end up at the local Goodwill. 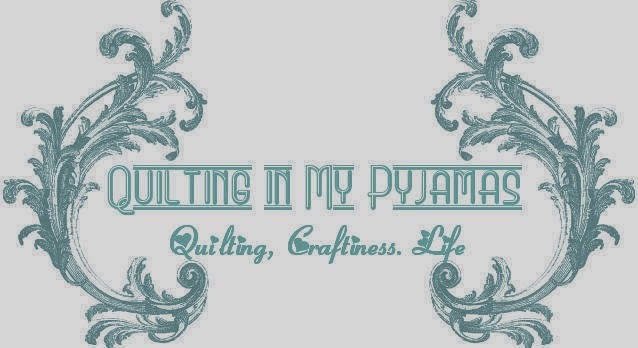 It's been another slow paced week on the sewing front here at Maison Pyjamas but I'm enjoying it. Aside from finally finishing the Dresden blocks this week, starting and finishing a surprise project and hand sewing another Tis the Season block there was a lot of other slow creativity happening. Half the Dresden's have actual sashing. Now I'm stressing out about getting everything to match up at the end. I pressed and cut half of the red and black and white quilt into strips because if I don't get moving on that project it's not going to be done in time for my nephew's birthday in August. . By the way I just want to reiterate how much I hate pressing seams. I must really love that kid because this quilt has a billion of them. I went mad with my rotary cutter and cut the rest of the fabric into strips ready to bang together when I get a spare 5 minutes three hours. I have some loose goals for this week but we'll see what develops. Life is good. Pop on over for a sticky beak at what other creative types have been up to this week. Just goes to show how much you can get done with an extra day on the weekend. You have been busy and I love all of it. I'm still in love with your Dresdens, they are going to look amazing all sewn together. Love your label too, that looks so good. Love the red black and white and you are becoming the queen of stitchery. I'm still in blog slow down mode. Great fabric for a boys quilt. I very rarely press seams as I go, I have a terrible aversion to all forms of ironing. Not bad for 15 minutes.......! I, too, hate pressing seams. Or ironing large pieces of fabric. Or clothing. Hell, I just hate the iron and everything you do with it. Well, except my antique cast iron iron that I use as a doorstop in my bedroom - that one can stay. Lots of gorgeous progress there in whatever time is available in the sewing room. Love the way that red/black/white is coming together, very sad about all the pressing. Looks like you're still managing to get a lot done. No baking today??? I did... I baked up some cupcakes for Father's Day, stuck them in the freezer. Not bad for a slow week Mrs P.....!! I think preparation is the key to getting things done...when you have a spare minute or two cut those strips/pieces for the quilt you are putting together, or trace off that stitchery ready to stitch in front of the tele on a cold night..the dresdens are coming along nicely....and love the black/white/red quilt....have a great rest of the week....! Careful Marg doesnt knock you off your perch, 146 yards plus the rest could be tempting!! I really love the Dresdens the sashing is a great choice, can you please hurry up and finish it so i can admire it in its entirety. Thanks! ps how do you make your labels?? Yep, Kiddo has absolutely no appreciation for my fabric. I can only hope that at some point in her life the fabric hoarding gene will kick in! Lots of good stuff on your blog. The Dresdens are looking gorgeous, I like the pink sashing. The red and black project is looking good too. I try to press as I go, I hate saving it all up. Thanks for linking up this week. Hope your slow crafty mojo keeps working. I love your label can't wait to see the unveiling! and the black, red and white, beautiful.. great week, without pressure (and all that baking you did too!). Love the red/black quilt - it seems very manly - perfect for a nephew. You are so encouraging to me, I've gotten some sewing in too-I'll post later this week. Good thing you aren't told to STOP after 15 minutes, lol! Great progress on all fronts. Being off sugar just now, those cupcakes are looking pretty great. Can't wait to see the suprise project. Can you send Little Miss Sunshine to my house with your stash? Not that I want that day to come or anything. Just sayin'. Those Dresden plates are absolutely beautiful. I think I am always telling you how wonderful they are. Love your label for your surprise project. You have been an extremely busy beaver Miss Shay. I would say you have much more than 15 minutes a day this week. You have accomplished so much and I ADORE the Dresden plate quilt. I don't know who Little Miss Sunshine is, but I could leave my stash to her too. Beats the dumpster, right? BTW, I replied to your comment before I saw how much you've gotten done this week. Well done! Your projects are moving right along! The pink sashing on your Dresdens is perfect. And I'm always a sucker for black, white, and red quilts. They're always just stunning. Love that red and black quilt! Those Dresdens are looking so awesome! And I love the cupcakes!